The DG-300 was a standard class glider produced by Glaser-Dirk Flugzeugbau as a successor to the DG-100. Whereas the original DG-100 had a really small cockpit opening for the pilot to get into, DG decided to focus 95% of the DG-300 design budget on making the hinged canopy as big as physically possible and made it entirely out of Perspex. The other 5% of design effort went into minimising the size of the instrument panel to ensure that no pesky flight instruments could point out that the performance was not quite as good as the brochure claimed. Whilst never quite achieving the popularity or the real-world performance of its contemporaries, the large viewing area does give DG-300 pilots a FANTASTIC view of other gliders as they disappear into the distance. Overall the DG-300 is a good looking, fun to fly glider with auto connect controls and a lot of Perspex. 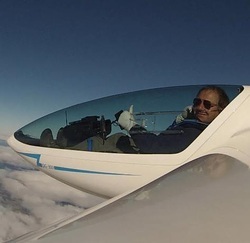 A great SIFOW glider for pilots with smaller feet.